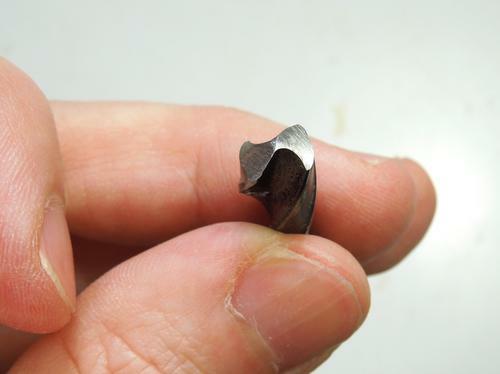 So I have been using a bench grinder to sharpen my bits, which I think I have been doing real good with. But there is a 3/8 bit that I used for some metal and have a interesting profile but I reshaped the head to be like a normal twist bit. It cuts chips very well, but there is a wide point on the bit. On a normal' bit there is a nice point. The one I sharpened has a wide point, almost 1/16 or 1/8. Someplace in that range. I do not know what I did wrong. I kept the angle the same, at 120 or whatever. But what about The angle for the flute directly? I think I had it at 10' maybe more. Can't say because I do free hand. So what would be some details for sharpening a bit correctly so it has a good point, to keep from running on the wood. Browse other questions tagged drill-bits or ask your own question.